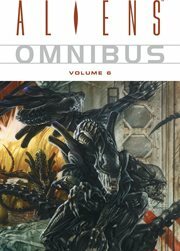 The item Aliens Omnibus, Volume 6, script Mark Schultz ; art Doug Wheatley, (electronic resource) represents a specific, individual, material embodiment of a distinct intellectual or artistic creation found in Austin Public Library. Mankind has always struggled to balance exploration and exploitation when stepping into new lands. In the era of the colonization of space, the discovery of new wonders is countered by the awful realities when species once separated by light years of airless void are suddenly thrown together, and the heady intoxication of discovery becomes the feral nightmare of a battle for supremacy. Humanity's arrogance and greed have helped the Alien plague spread, and now men and women must step forward to ensure that the future of the galaxy does not become the age of the Alien! Featuring the talents of Mark Schultz, Chuck Dixon, Ian Edginton, Doug Wheatley, Gene Colan, Phil Hester, Eduardo Risso, and many more. Collects Apocalypse, Xenogenesis #1 - 4, "Head Hunters", "Tourist Season", Aliens: Pig, "Border Lines", the Aliens: Special, "Purge", "Glass Corridor", "Stalker", "Wraith", and "Once in a Lifetime"